That was a wonderful post. I had thought about what to do with my sons teeth when they come out and I will certainly be keeping them. I also kept his stump - I could not bring myself to throwing that away. We spent 9 long months connected to each other. This is beautiful, and made me cry, too. When my husband's Grandma died last year and we helped pack up her house, we found she had saved every one of both her sons' teeth, glued to an index card and labelled which tooth it was. It was very sweet. I remember rooting around in my mom's jewelry box. I loved to look at her pretty things. 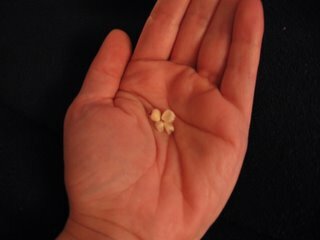 When I was about 12, I found the little velvet envelope with all of my baby teeth. I felt loved. My daughter didn't have a hair-cut until she was 5 years old and Of course, I kept a lock of her baby curls still hanging on the ends of five year old hair. Now she thinks I need to keep some everytime she gets her hair cut. It's so sweet and so clear that it makes her know how much I value her that I didn't let that hair go. But, if this keeps up, soon I'll be a hair collecting freek! Actually very soon, I'll be joining the ranks of teeth collecting freeks too...3 loose at once. And I know I'll cling to them too....when she's changed so much that I can only glimpse little hints of the baby she was. My grandmother saved my baby teeth and a lock of my hair from the first time it was cut. I didn't think that much of it when I saw it as a teen, but now? Now I get misty-eyed just reading your post and thinking about it. I'm glad I'll get to see her during Thanksgiving-I'll have to look through all of my old baby things and cry some more-since that's all I seem to do lately! That sounds pretty perfect of a place to me.